Message boards : News : Plot Progression! These are plots that I recently finished cleaning up that show the positions of the centers of the Sagittarius stream (the bases of the arrows) and the directions of the stream (arrows). The numbers represent the Sloan Digital Sky Survey stripe number of that stream detection. The top plot is looking at the Milky Way edge-on - the dotted line is roughly the size and position of the Galactic disk. 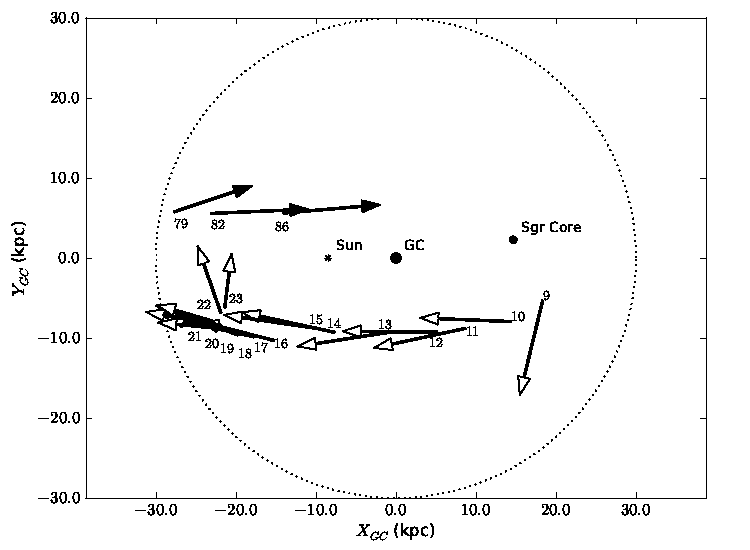 The bottom plot is looking at the Milky Way face-on - the dotted line roughly represents the edge of the Galactic disk. Black arrows are below the disk of the galaxy, and white arrows are above the disk. Distances are in kiloparsecs (kpc), or thousands of parsecs; a parsec is about 3.26 light-years. 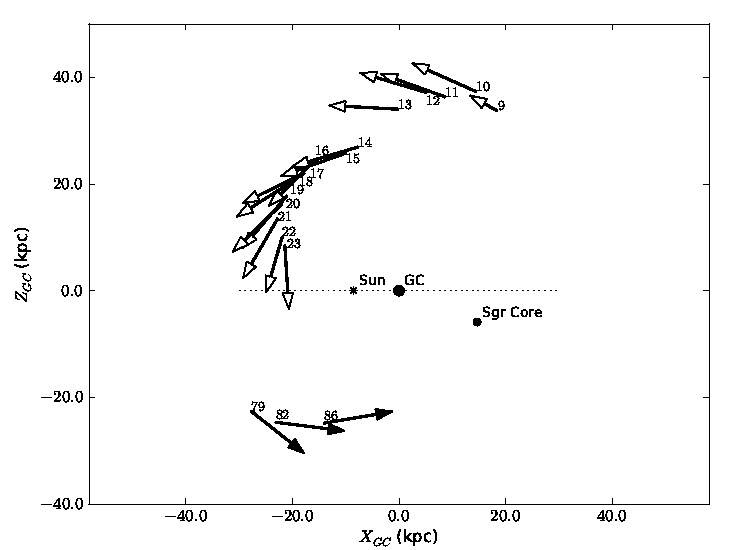 "Sgr Core" is th elocation of the Sagittarius Dwarf Galaxy. As you can see, the results indicate a continuous stream that wraps all the way around the galaxy. (There are no arrows where we don't have data) Also, you can see that this stream is HUGE - its average orbital radius is as large or even larger than the radius of the Milky Way galaxy itself! Thanks for the updates, all the pretty pictures and a big welcome to Steve!! Oh! This is ....... AMAZING ! Video, where would be dark-grey-dotted Galactic disc AND the Saggitarius stream displayed in motion, (estimated motion just in very near future) calculated using the NBody engine on a supercomputer (server) ? The first picture shows everything really well, especially after I read down and saw what the black versus white arrows meant. Easily interpreted pictures are good and helpful. Message 56201 - Posted: 15 Nov 2012, 11:54:52 UTC - in response to Message 55119. These two graphs are realy informativ. They show the speed and direction in that the masses of the sagitarius stream are flying. They dont show how much masses, respectively energy, ist flying at each point. I don´t know whether the current data will let you draw this information from it. I think, it would a give a much different view on this and be of much interest. Do you have a link to the paper/preprint available? I'd love to read the details. We recently received the referee review (as part of the peer review process). Once we address his/her comments and hear back, we will post a more final manuscript to arXiv (http://arxiv.org/archive/astro-ph). I very much hope that this will be done by the end of the month.